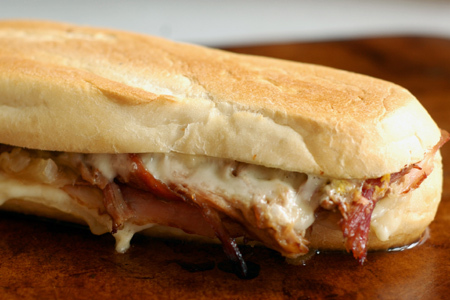 a Cuban sandwich, but also loves a Rueben? He makes a Cuban Rueben! 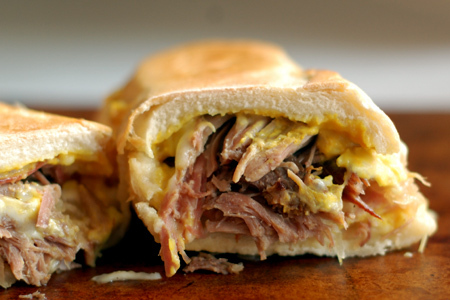 A classic Cubano sandwich is roasted pork, ham, Swiss cheese, dill pickles, and mustard on Cuban bread. It is then press-grilled to gooey deliciousness. My version is adds a Rueben twist by replacing the pickles with sauerkraut. Since I don't have access to Cuban bread, I use a par-baked French baguette. Put a pizza stone and a large cast iron skillet in the oven and preheat to 350*. Mix both mustards in a small bowl. Cut off 12" of the baguette and slice it lengthwise. Smear each half of the bread with the mustard mixture. Lay the cheese slices over the mustard on each half, fold it as needed so as to not overlap the edges of the bread. Pile the pork on evenly on the bottom half of the bread. Lay folded slices of ham on top of the pork. Spread the sauerkraut evenly on the ham. Put the bread top on, and press it down firmly. Set the sandwich on the pizza stone and cover it with the skillet turned upside-down (to form a dome). Remove from the oven, slice in half and serve. As a Cuban girl raised in Miami, and being very critical when people call their sandwiches ' Cuban', I loved this version. The smokeyness of the pork paired with the tangyness of the saurkraut... Delish. They went quickly at my last get-together. Thanks, chica! That's high praise indeed. I'm so glad that you and your guests enjoyed the sandwich. Great thinking! And nice photos!